Ubisoft added Patch 1.11 to prepare players for Watch Dogs 2's upcoming DLC, released tomorrow. Afterwards, /r/Watch_Dogs mod EpicStreamMan told me, “We started hearing rumblings of weird text conversations between NPCs.” In-game, four teenagers who call themselves “Shuffler hunters” had apparently gone missing, local radio reported. Manic posts on the official Watch Dogs 2 Tumblr confirmed players’ suspicions that a mystery was bubbling. The posts refer to “The Shuffler,” an urban legend so scary that those in-the-know allegedly lost their minds. Later, the posts announce that “The Shuffler” is real. 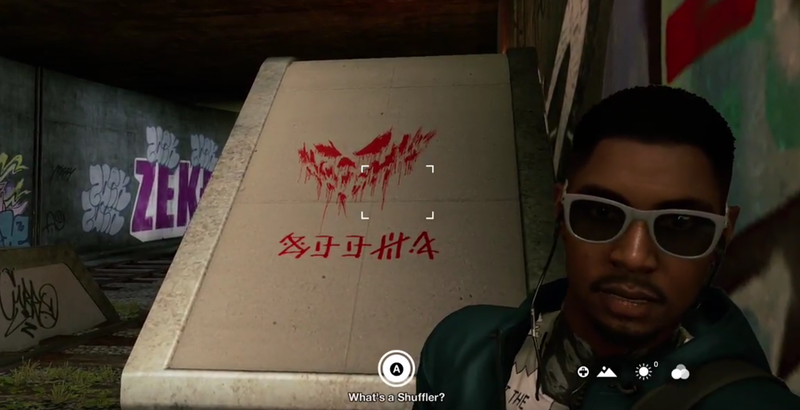 Fans soon discovered that the missing teenagers went AWOL while investigating “The Shuffler.” On February 15th, they found four instances of red, hellish-looking graffiti in Watch Dogs 2's Oakland. Around that graffiti, players heard strange noises, and when viewed through their phones, the locations revealed clues to the lost teenagers’ story. Right now, players are at a stand-still, waiting for Ubisoft to drop another hint. Regardless, the surprise quest has reinvigorated the game’s fan community, which uniformly seems to love a good mystery. “I don’t think anyone really expected something like this,” Watch Dogs 2 Discord member TealSummerNights told me. “People are listening to the in game ratio stations, checking every nook and cranny of virtual SF. Some folks have even been digging through the game’s code!” The bulk of “The Shufflers” quest exists in-game, so it’s not a true ARG, but players are treating it like one, already dismantling the game in style of its hacker protagonists. Last September, Watch Dogs 2 players solved the game’s first ARG in a matter of days. It won’t be long before this one’s done for—and maybe the answers will come with the DLC. Thanks for the tip, Kotaku reader Coleman.